Having just returned from Cards Middle East 2013, I am pleased to report that the economy in Dubai appears to be booming. At least it appeared that way from inside the exhibition hall! The investment which went into the construction of some of the exhibition stands was simply mind boggling. With the same budget as the company exhibiting next to us, I could have built a small house. Arriving just one day before the start of the show, the other exhibition stand construction teams eyed us with amusement as we arrived with just a few bags of exhibition equipment. It was obvious that they thought we’d left it too late to set up an exhibition stand measuring 8m x 9m and 3.8m high! Three of us set up the entire stand in six hours. The army of construction workers next door simply couldn’t believe it. Not only did our stand look incredibly professional with its pre-printed graphics, but it was put up in a tenth of the time it took to build their stand. This is significant because the time it takes to build and dismantle an exhibition stand can make up a significant proportion of the overall costs for a show. 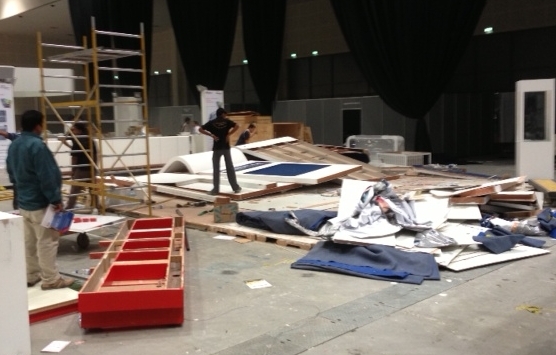 When it came to breaking down the stand down after the show, we had everything packed away within four hours. The team next door had barely started by the time we had finished, despite attacking the MDF and wood construction with sledge hammers. I can’t believe so many companies still conduct their exhibition programmes like this. Aside from the investment in materials and manpower, the wastage is outrageous if not totally irresponsible. The entire stand from next door ended up in the skip. That’s the beauty of modular exhibitions stands. Our own system of CROSSwire, TRUSSwire and TECHwire can be re-used time and time again. It can be assembled and taken down again in no time at all. What’s more, it can be adapted easily to meet each show’s specific requirements. To find out more about 200m2’s range of exhibition services, including exhibition stand hire, contact us today. Previous Previous post: Exhibition Stand Contractors UK: Who should you choose? Next Next post: Exhibition Staff: Are they important?